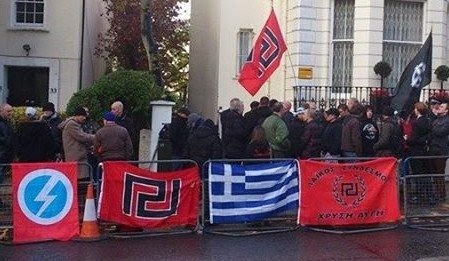 Golden Dawn is doing whats best for Greece, as the NBU shall do whats best for Britain. When I first heard of Golden Dawn it was in the Western Media demonising it, saying it was a Nazi party and violent etc. Anyone with an ounce of intellect knows that the Western media lies about everything about anything about everyone; so I decided to check Golden Dawn out myself through the power of the internet. I came across videos where Golden Dawn were passing out bottles of water and vital food supplies to the Greek’s poorest. I saw videos where Golden Dawn were clearing the streets of rubbish and litter. I saw videos of Golden Dawn exposing how corrupt their political elite has become and how the EU is bankrupting Greece in the name of political correctness. I saw videos of Golden Dawn showing how much unemployment and homelessness there is in Greece. Now I’m no expert, but to me that doesn’t sound very “Nazi and violent” does it? Hail Golden Dawn, Hail the NBU, Hail our Leader and Hail Britannia.